To celebrate our 50th podcast episode we have created a FREE eBook with our top 50 games. These activities are proven winners that will have your students moving, having fun and learning at the same time. I would like to thank Jarrod Robinson for his amazing mentoring during the past four years. I have taken his idea from his 50th podcast episode. Thank you to everyone for listening and supporting us along the way. This episode is a celebration for everyone; we want teachers using this free eBook to help increase student engagement and motivation. Please check out the video below as well, we are truly grateful for all the support we have received from teachers around the world. We may not see each other face to face each day; through social media channels we are lucky to be one huge supportive group of super star teachers. Please enjoy these games; let us know your thoughts of our 50 top games. Do you mind if I share the 50 games resource with them? Thanks for the resource, I’m definitely keen to go back through the pod casts and see what else you’ve got. You will also find some great ideas from the amazing guests i have interviewed in pervious episodes Ben. Hopefully this helps, please feel free to email me if you have any questions or would like some more advice mate. I love seeing studnets move, play and learn all at the same time. Thanks Dale and Jarrod! Our school year might be ending but it’s great to save and share this with my team during our year end planning and inservice for the next school year. Kudos to all that you do for the #physed community. 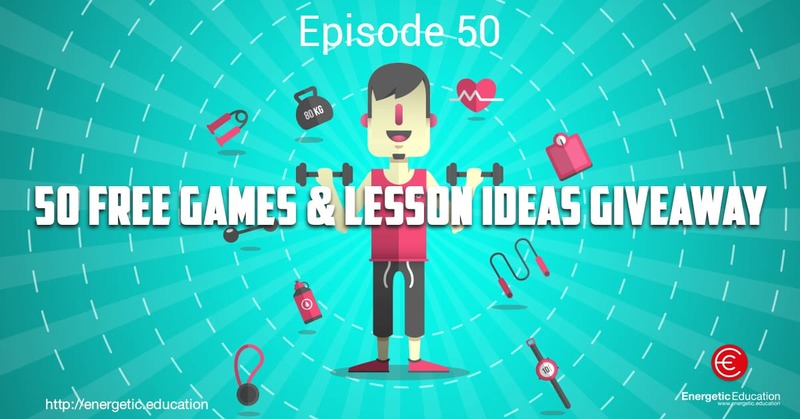 Can you please send me the 50 free games and lesson ideas. I’m an elementary (K-5) P.E. teacher in Southern California, USA.